Due to it’s widely accepted success rate and non-invasive nature, a rhinoplasty (or non-surgical nose job) is one of the most desired cosmetic enhancement procedures of the decade. Many choose not to undergo a plastic surgery because they want to avoid hospital expenses and a long recovery process. That is why Holistic Bio Spa has the best solution for you: non-surgical nose job. A non-surgical nose job is a procedure where the tip of the nose is enhanced and lifted. 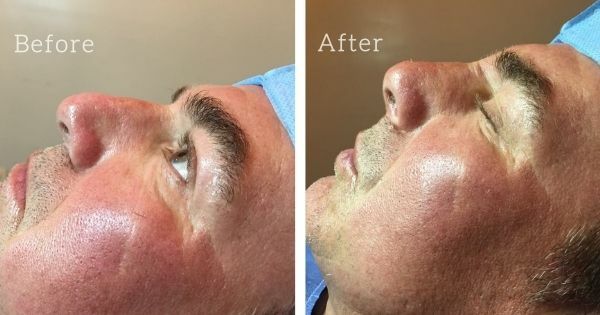 It is a minimally invasive technique in which special surgical-grade threads called PDO (polydioxanone) are inserted to contour and define the nose. These threads are fully accepted by the body, so you will not experience any sort of reaction. The PDO threads boost your body’s natural production of collagen and new tissue around the nose, thus resulting in a firmer, more aesthetic look. 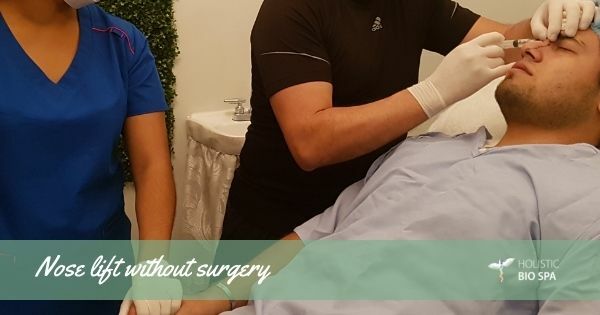 Dr. Juan Ortega, our board certified plastic surgeon in Puerto Vallarta, uses local anesthesia (about the only part of the procedure that causes discomfort) to numb the area and then make a small incision of about 3mm. After the incision is made, the aesthetic enhancements similar to a surgical nose lift are completed. Angle, width, lift, and shape can be modified to complement your natural golden proportions. The technique was developed by a Bulgarian surgeon named Nicolai Served. Recently, this alternative to plastic nose surgery has become a trend in South American countries due to it’s low cost and quick recovery. Where conventional plastic surgery has it’s benefits, beyond a doubt, this quick and effective procedure has large benefits. What if I don’t like my new nose, can I get a rhinoplasty undone? There are absolutely no risks to this simple procedure. If you are not happy with your new nose, you have a month to reverse the procedure by removing the thread. The reversal procedure is equally simple and risk-free, reverting your nose back to it’s original form. What do our patients think about their non-surgical nose lift at the Holistic Bio Spa? “I am very happy with the service Holistic Bio Spa provides, I had done in the past masages, colonics and foot detoxes and I was very happy with the results, immediately my health improved. Now, I am fascinated with Dr Juan Ortega, he made a rhinoplasty to my nose without surgery! In just 40 min he lifted my nose. It is a natural and reversible method , but I loved it! No hesitation in recommending the best place for alternative medicine in Puerto Vallarta!! Affordable and very good results! It’s worth going”. Dr. Juan Ortega is an experienced certified plastic surgeon in Puerto Vallarta who works with us here at the Holistic Bio Spa. Dr. Juan is a man of core values and interests rooted in the human potential for natural healing, art, classical music, and nature. He forms a part of the Holistic Bio Spa family because he loves to help people be the healthiest, most beautiful version of themselves with natural and holistic methods.